It may not catch your eye sitting next to these cutting edge Android phones, but place most cheap devices next to the Moto G and its beauty becomes clear. The Moto G is belle of the budget phone ball. But just because it’s jaw-droppingly cheap doesn’t mean you can afford to throw it around. Treat it like a lady for heaven’s sake, or at least like a normal, breakable smartphone. You wouldn’t whisk your love into the frigid night air without offering your jacket, so put a case on your Moto G before it catches a cold. 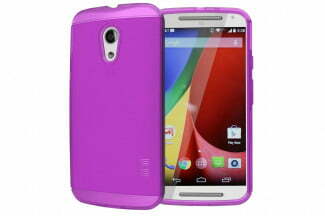 Related: Moto G review, Moto G trips and tricks, Moto G problems and solutions. On this page you’ll find cases for the second generation Moto G (2014) which is slightly larger than its predecessor. Head to page two for Moto G cases to fit the original. 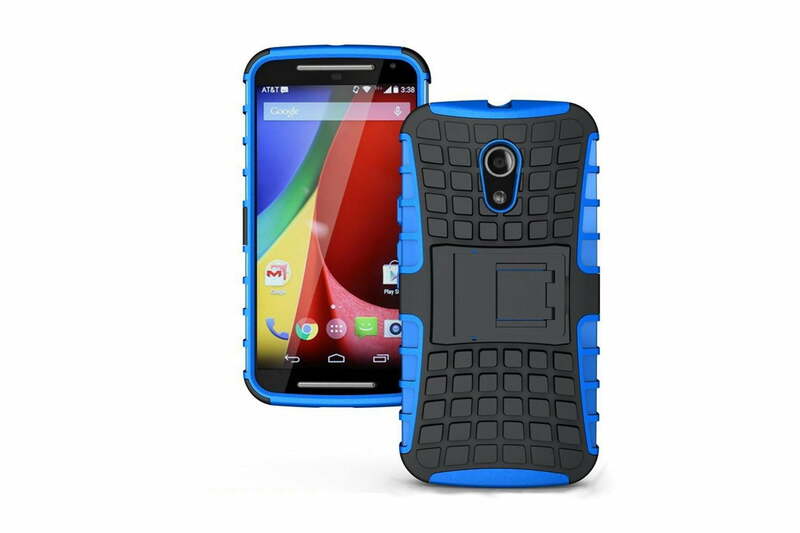 If you get bored with the look of your Moto G, or you manage to scratch or otherwise damage the back cover, then you can always buy an official shell. There are eight different colors to choose from including plain black, lemon lime, and raspberry. These shells are made by Motorola so they’re a perfect fit. They won’t add any bulk, but they won’t add any protection either, they’re strictly for style. 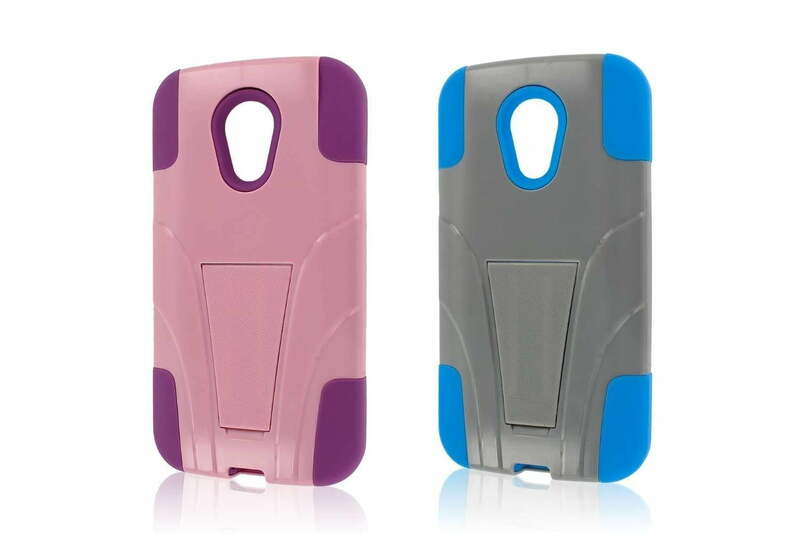 This is a basic TPU case that’s flexible, so it’s easy to fit and it will offer a little bit of protection in the event of a bump or a fall. There’s a small bevel on the front to keep the screen from touching any surface it’s put down or dropped on. The matte back and sides add some grip and there are gloss strips top and bottom, and a gloss Tudia logo, to add some visual style. The cut-outs are accurate, but the button covers are a wee bit stiff. You’ve got a choice of three colors or you can opt for the clear version. You won’t find real leather at this price, but this folio-style case combines a hard matte, black polycarbonate shell with a polyurethane front cover. 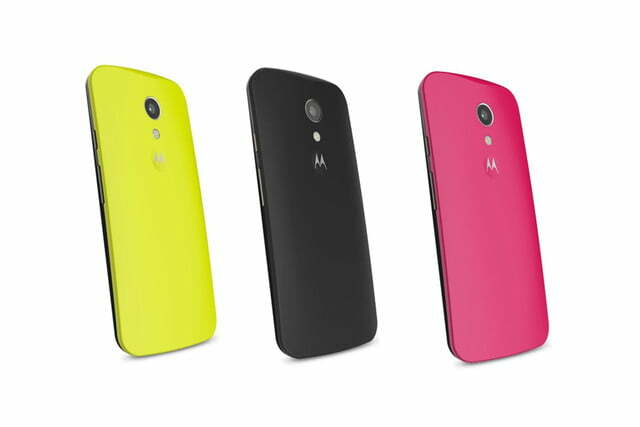 Your Moto G snaps into place and benefits from all-round protection. The interior lining is soft microfiber. 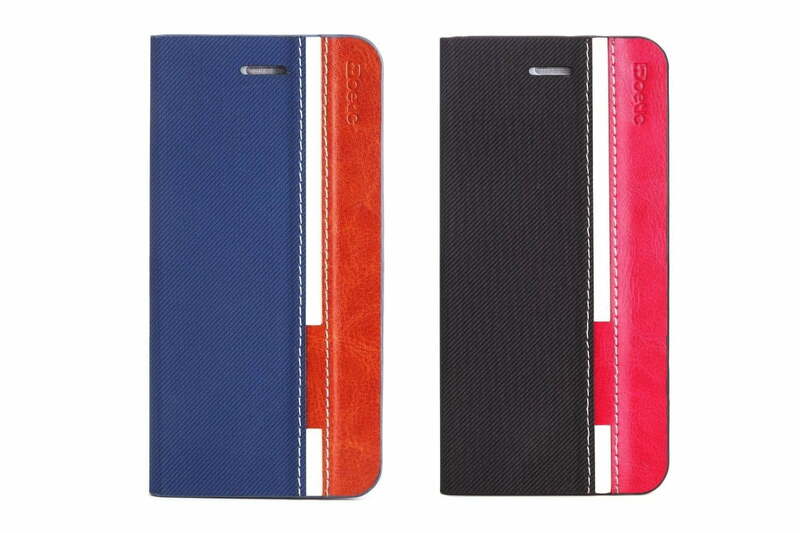 The cover has a thick grain portion that’s easy to grip, and a contrasting leather-look, colorful stripe with white stitching. It’s pretty good value for the money. For chunky, rugged protection you’ll struggle to find a better value case than this. There’s an inner, flexible TPU layer that wraps around your Moto G, and then an outer polycarbonate shell with a kickstand built into it. With this case on you’ll find the Moto G easier to grip and it should be a lot less likely to get damaged in a drop. The button covers are definitely stiff and it’s very chunky, you might find it gets snagged pulling it in and out of your pocket. In the plus column it’s very cheap and it comes with a stylus and a screen protector thrown in. None of the big name case manufacturers have released anything for the Moto G (2014) yet, but there are plenty of budget options to tide you over, and it doesn’t get more budget than this. It’s like a smooth version of the LK case above, combing a malleable inner layer with a tough outer skeleton that contains a kickstand. It’s bulky, the kickstand is a bit flimsy, and it doesn’t really add any grip. 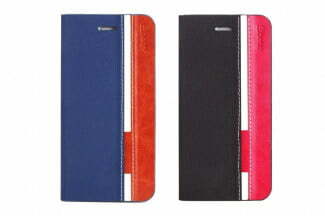 But it is available in lots of color combos, there’s even a glow in the dark version.